The krater is described as being 70 cms high, with a silver wreath on the walls, and maenads under the handles. It looks as if this is the calyx-krater that featured in Greek Bronze Vessels from the Collection of Shelby White & Leon Levy (2005), 24-25, no 9 [further details]; indeed one of the maenads graces the cover. The newspaper report suggests that it came from a "royal tomb" (βασιλικό τάφο). The funerary stele carries the personal names of Menon and Kleobolos. The link between the Shelby White fragment and the lower part excavated near Porto Rafti was made by George Despinis. There is no further comment about the sources for the two pieces though the report does hint that the due diligence process was lacking (χωρίς να έχει ελεγχθεί η νομιμότητα της προέλευσής τους). From September 23, 2008 the pieces will feature in the "Nostoi" exhibition at the New Akropolis Museum. To visit Nostoi in Rome with an expert, join Dr. Laura Flusche on September 4. Details here. 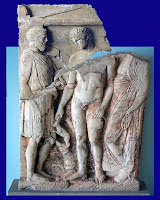 For the display of these two pieces in Athens, click here.